Author: John Stevenson Hall †. Edited by: Herrmann Jungraithmayr, Jörg Adelberger. Series edited by: Herrmann Jungraithmayr, Norbert Cyffer. 20 pp. Roman, 217 pp. The present monograph is the careful edition of an unpublished manuscript by the missionary Rev. 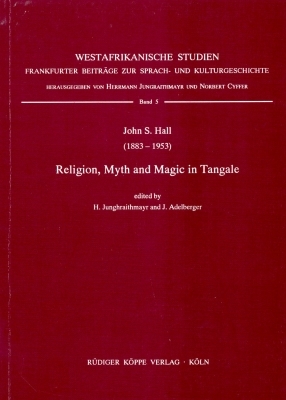 John Stevenson Hall (1883–1953) on the religion of the Tangale and related topics. Hall worked with the Tangale, an ethnic group in Bauchi State in north-eastern Nigeria, between 1917 and 1933. He was very interested in linguistics and ethnographics, and his heritage included detailed records of his informants' reports. This study represents a rich source of information on the history, religion, rites, belief, and the general world-view of an ethnic group. It is also a documentation of a spiritual world which is being increasingly superseded. In the same series a proverb collection with analyses and an anthology of Tangale folktalkes have been published, see the links below. I find the editors and the author’s daughters decided for the best leaving the manuscript as near to the original as it was possible: in this way we have in front of us a very important chapter of a native African culture before the big changes of the following half-century.